A tummy tuck may be the solution to your dream of a flat abdomen, but if you are also concerned with excess skin on your back, and loose skin on your thighs, a body lift may be the best option for you. Body lift surgery addresses the mid and lower body, covering the abdomen, upper and lower back, hips and buttocks, and thighs. Some patients claim their cellulites also improve after surgery though we do not directly claim this as it is not an absolute result of the surgery but more on just the effect of skin tightening on the area. Body lift, also known as belt lipectomy, can be done in one surgery or in several sessions depending on the health status of the patient, their personal schedule, and the result they want to achieve. Usually, Prof. Somyos Kunachak recommends several sessions for patients who may make do with a less invasive approach or for those with extreme excessive skin that taking everything in one surgery may prolong the recovery period significantly. WHO ARE THE CANDIDATES FOR BODY LIFT SURGERY? 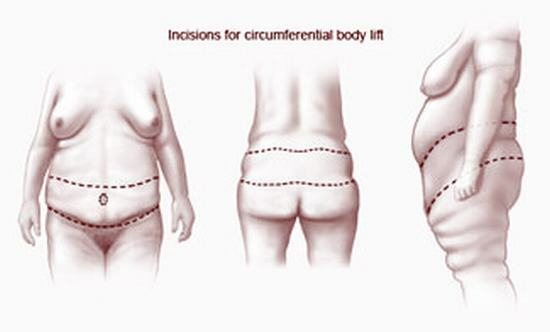 Body lift surgery will work best for patients who had lost a lot of weight and are already on their ideal body weight. Patients who are still planning to lose weight are discouraged to do the surgery because losing more weight can cause more loose skin, and therefore a repeat surgery, which, though possible, is not advisable. Body lift will also work for people with loose skin on the buttocks and on the back of their thighs, loose skin on the hips and outer thighs, loose skin on the front thighs and excess skin on the abdomen with loose skin on the inner thighs. Since body structure of patients greatly varies, the procedure and the areas that will need more attention will be more personalized as well. Patients who are considering this surgery should also accept that there will be visible scarring and that though our surgeon will do everything to make the incision as inconspicuous as possible, we cannot guarantee how the scar will form, and patients should accept this before consenting to the surgery. Body Lift or Belt Lipectomy is the kind of lifting procedure where the incision will run the whole circumference of the lower back and the abdomen. The incision usually extends on the umbilicus as well, sometimes higher, depending on the amount of skin that needs to be removed. On some cases, muscle tightening is also performed along with this procedure as well as liposuction, but this will all be discussed during your personal consultation with our surgeon. Body Lift is always done under general anesthesia due to the surgical time which usually takes about 3 hours. Incisions are placed strategically to be hidden if possible, except on cases when putting the incision too further down will just not benefit the patient. Drains are usually placed during the surgery to facilitate removal of fluid which may prolong healing. Drains can be removed in a matter of days, depending on the amount of fluid that is still coming out from it. Body Lift is an invasive surgical procedure so patients should allow at least 4 weeks of rest period before going back to work and at least 2 weeks stay in Bangkok for proper follow up check up and for suture removal which is done 14 days post-operatively. Compression garments will be recommended after surgery to minimize swelling and to support the incisions during patient ambulation. Though patients are highly encouraged to rest, ambulation is also recommended as soon as the patient is strong enough for it to promote better blood circulation. Activities can be gradually resumed in 4 weeks after surgery but only as tolerated. Recovery period for this surgery is significantly longer and we highly require patient cooperation with us. Patients who had undergone body lifts will usually be in bed for at least 3-4 days, we therefore recommend patients who are still planning their trip to book their accommodation in Aphrodite Inn, our center’s affiliate hotel. Aphrodite Inn is located just beside our clinic with a whole floor dedicated to our center’s patients. The 2nd floor of the hotel is connected to Yoskarn Clinic via an adjoining door so your surgeon and other nurses can come to your aid anytime in addition to hotel staffs. Each room on this floor is also modified to meet our post-operative patient’s needs with mechanical beds and soft mattresses for comfort, Oxygen outlet, and emergency medical kits. Room service is also available for patients and guests alike who are not up to having meals outside. Breakfast is complimentary for you and your companion all throughout your stay.